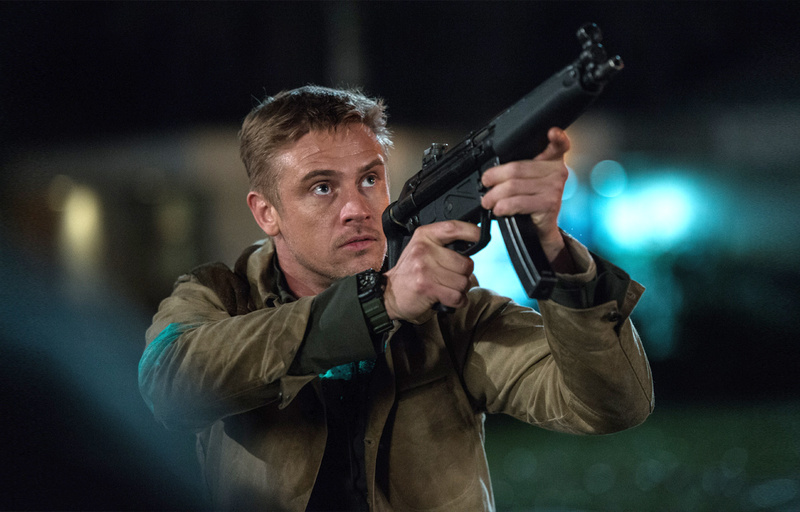 Boyd Holbrook has been steadily building an impressive career, working in drama and action on screens big and small. He’s been seen in movies such as Run All Night, Morgan and Out Of The Furnace and enjoyed kudos for his work in Logan. In The Predator, he plays troubled military man, Quinn McKenna, looking to protect his family from an otherworldly threat. Here, he talks working with Shane Black, cast camaraderie, and his first Predator experience. Who are you playing in the movie? Quinn McKenna, he’s ex-Special Forces. He’s basically doing contract work. Probably not a lot really to live for in the sense that he’s very detached from his son. He’s estranged from his wife. He’s kind of a rogue. He’s living paycheck to paycheck; if you got a job in South America and you need somebody, he’s your guy. We find him in Mexico and he’s got these objects on him after a mercenary job has gone wrong. He’s found all this Predator gear, these gauntlets, and these de-cloaking things. He needs to get them back home because no one’s gonna believe him. He sends them to his son, but then he gets arrested and sent to a military psych ward for some evaluation, partly because the government is trying to keep the Predators under wraps. He’s aware of them, but there’s a cover-up. He has to team up with these guys who in some ways have been kind of rejected and are all suffering from some form of PTSD. They call themselves “the Loonies” and they’re a throwback to the team from the 1987 movie. How does Jacob Tremblay’s Rory factor into the story? He’s Quinn’s son and they don’t have a close relationship. Mainly because Quinn doesn’t know how to connect with him or relate to him. I think that audiences will relate to the challenges they deal with as it speaks to some very human issues. Shane and I sat down. I read the script and I talked to him a little bit about it. And we just kept a conversation going on. So that’s basically how it worked out. How was it working with Shane as a director? He’s pretty brilliant. He has a way to hinge a scene that, whatever the subject matter, he finds these comedic beats. You have to be on your toes with him – really on your toes. Was he also collaborative with the cast? Did you get to pitch ideas? Oh, absolutely… the first day on set, we rehearsed a scene before lunch. Everyone was spit-balling ideas, coming up with lines, you know. We broke for lunch, and afterwards, Shane asked us to sit with him. He’d turned our spit-balling into a two-page scene to shoot right then and there! Yeah. I think in general, actors are pretty playful and empathetic people, so no one was a diva by any means on this one. You couldn’t have cast the film better because of the way it was to shoot. Augusto Aguilera plays Nettles, and he’s brilliant. Alfie (Allen) did something great with his character. Keegan’s (Michael Key) had all this experience with sketch comedy and knows what works and what doesn’t. And then you have Thomas Jane, who’s doing this incredible character. In amongst all the CG, there are a lot of practical sets and locations. Does that help you as an actor? Yeah, it really did. We were actually working in a real space. It’s so much better than reacting to something that is an X on a wall or something like that. Did you watch the original Predator? I think it came out when I was six, and I probably watched it when I was about 12 or 10. I thought it was terrifying. Yeah, it’s pretty terrifying. I think it was also just one of the great thrillers like Bloodsport, Rambo, all those sorts of macho films of that time.